Richmond has been making great strides in bringing together our community to create a more resilient, sustainable, and equitable city. As we are all working so hard in our respective areas, we don’t always have time to stay in touch with our colleagues who are doing similar or complementary work. Let’s get together to see what everyone is doing to make Richmond an even more resilient city! 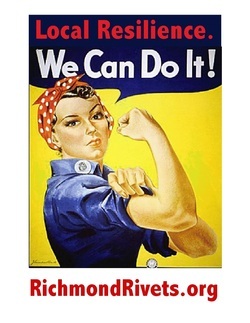 The Richmond Rivets Transition Town would like to invite you join us in planning the first Richmond Resilience Fair to be held in early 2012. The purpose of this day is to bring together Richmond leaders working to make the City a more sustainable place. We would highly value your participation in imagining this event. You will have the opportunity to network with others, discover opportunities to collaborate, get the word out about what you are doing and enjoy the camaraderie of a community working together for a great purpose.